This full-day garden-based workshop aims at encouraging participants to observe garden and landscape plants, focussing on their growth through the year, looking at how they compete with each other, how to assess prospects for their longevity and their suitability for a variety of garden locations. 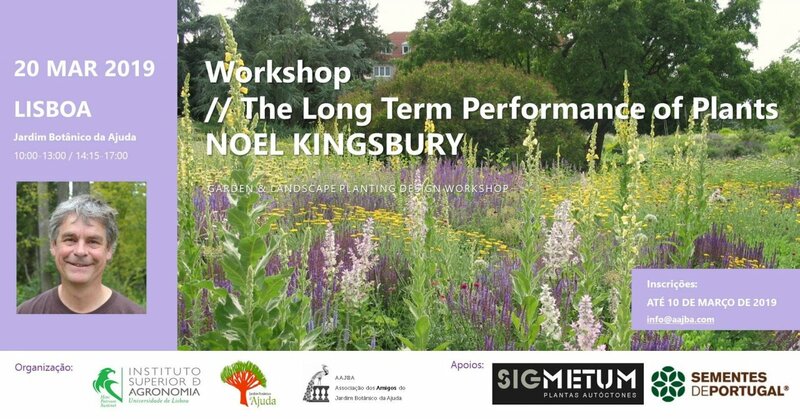 Practitioners can then use their experience and knowledge of plants to plan for appropriate levels of maintenance and in particular to plan for the long-term. There will be an emphasis on naturalistic and ecologically-based planting schemes. Integral to the day is to get participants thinking about how plants are linked to their natural habitats and ecology and how this connects to the way we use them in gardens and landscapes. Encouraged to get down on hands and knees to get ‘the rabbit’s eye view’, close observation of plant growing habits and lifecycles through the year can greatly empower us as professionals. Garden designer, writer and researcher in the fields of horticulture history, gardening and planting design. He has published around 25 books and has written for many magazines and newspapers, including The Garden Illustrated, The Garden, Hortus. O curso visa incentivar os participantes a observar as plantas, concentrando-se no seu crescimento ao longo do ano, observando como elas competem umas com as outras, como avaliar as perspectivas de longevidade e de adequação a diferentes locais do seu jardim bem como a sua componente estética. Arquitetos Paisagistas, Jardineiros e todos os interessados nesta temática podem aprofundar a sua experiência e conhecimento de plantas. Uma oficina única que coloca as pessoas a olhar para as plantas do seu jardim de uma maneira diferente.